"300: Like Sin City before it, 300 brings Frank Miller and Lynn Varley's graphic novel vividly to life. Gerard Butler (Beowulf and Grendel, The Phantom of the Opera) radiates pure power and charisma as Leonidas, the Grecian king who leads 300 of his fellow Spartans (including David Wenham of The Lord of the Rings, Michael Fassbender, and Andrew Pleavin) into a battle against the overwhelming force of Persian invaders. Their only hope is to neutralise the numerical advantage by confronting the Persians, led by King Xerxes (Rodrigo Santoro), at the narrow strait of Thermopylae. 300: Rise of An Empire - Sullivan Stapleton, Rodrigo Santoro and Eva Green star in this action prequel to the 2007 movie '300' which is based on Frank Miller's graphic novel 'Xerxes'. In 480 BC, Athenian General Themistocles (Stapleton) leads the Greek Army in a war against the invasion of King Xerxes I (Santoro), naval commander Artemisia (Green) and their Persian forces. Themistocles allies with the Spartans but they are still outnumbered by Xerxes' men. Who will be victorious? The film was co-written by Zack Snyder and Kurt Johnstad and also stars Lena Headey, Jack O'Connell and Hans Matheson." More details of 300 & 300 : Rise Of An Empire on wikipedia. 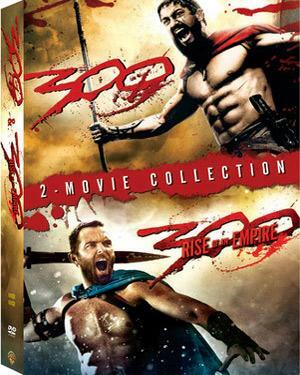 Original 300 & 300 : Rise Of An Empire DVD released by WARNER Bros comes in 3 disk DVD pack. DVD having 3 Subtitle. Duration of the Movie in DVD is 190 Min [approx.] While processing the order, we bubble wrap the DVD in its original packing and send it in sealed plastic or carton pack. We don't offer download of the Movie 300 & 300 : Rise Of An Empire, nor we send free poster of the Movie along with its DVD order. We also don't offer free wallpaper or song download of the Movie. Poster and other accessories of the Movie can be purchased separately. Buy English DVD 300 & 300 : Rise Of An Empire and watch them at the comfort Of your own home. Online shopping 300 & 300 : Rise Of An Empire DVD, Buy 300 & 300 : Rise Of An Empire DVD, purchase original English DVD of 300 & 300 : Rise Of An Empire. Online store to buy 300 & 300 : Rise Of An Empire DVD	, online DVD store india, buy English DVD, watch English movie 300 & 300 : Rise Of An Empire videos online. We don't offer DVD renting for English movies online, Buy Original 300 & 300 : Rise Of An Empire DVD @ discounted and cheapest price online in India.